Where to Play Twister for Real Money? Get ready for some excitement, as a twister is about to hit your online slot playing experience! As the name suggests, this slot focuses on the devastating weather phenomenon that strikes many areas of the US each year, however this slot won’t lead to damaged homes and devastation, but instead it could lead to some huge prizes and a massive amount of fun. First glances at this slot aren’t all that encouraging though, as Microgaming haven’t really made too much of an effort with the graphics. Stay with this slot though, as graphics aren’t everything, and Twister definitely proves this to be the case. All of the symbols at this slot are colorful, however they don’t actually focus on the twister. Instead, they focus on the poor people who are affected by it, including a rather confused looking old man, and a stereotypical redneck. You’ll also get to see caravans, trucks and even outhouses, all of which are being upheaved by the violent storm tearing through. Randomly, there’s also a gas station, which doesn’t really fit the theme too well. Overall though, the symbols at this slot really add to the feel of this game, and most players should really enjoy seeing them spinning around on the reels. It’s just a shame the graphics aren’t slightly better though. How to Play Twister Casino Game? Twister is a slot with 15 paylines, which isn’t a huge number. This does mean that the gameplay is really simple though, making this the perfect slot for those who aren’t too experienced playing this type of casino game. To get the game started, you’ll need to first decide how many of the paylines you want to play, remembering that choosing more will lead to more chances to win. You can also choose how much you want to bet, which can be anything from 0.01 coins all the way through to 150 coins. Making larger bets will lead to bigger potential prizes, so it can be worth betting as much as you can afford. Once you’ve got the reels spinning, there’s nothing else to do, aside from waiting to see how much you’ll win. You could win anything from a tiny amount, all the way through to the jackpot, which is worth a massive 150,000 coins – although only the very luckiest of players manage to spin this into view. Getting some free spins is more likely though, and these are explained in the next section. Don’t worry if you don’t manage to spin in a win though, as it’s easy to get those reels spinning again and see if you get luckier next time. Much of the excitement at this slot is caused by the bonus features that it offers, which can lead to some really nice prizes. This means that you certainly want to see them activated as often as possible! 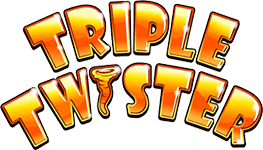 The first symbol to mention is the twister itself, as this is the wild symbol, meaning that it can replace all of the other symbols on the reels, aside from the scatter symbol. It appears pretty regularly, and can lead to some really nice prizes. There’s also a scatter symbol at this slot, and it is represented by the broken TV. Its main use isn’t creating combinations during the base game though – it’s the fact that it’s used to activate the free spins at this slot. When you get three or more scatters on the reels, you’ll be rewarded with 20 free spins. They don’t have any particularly interesting twists to them though, aside from the fact that all wins will be doubled while they are active. There’s one other feature to mention at this slot, and it is the Gamble feature. This is available to you after every win, however whether you use it is completely your choice. It allows you to gamble everything you’ve just won on the turn of a card – guess correctly and you’ll double your prize, but guess incorrectly and you’ll lose everything you’ve just won. You can play this game up to five times in a row, however most experienced players choose to avoid it completely. That’s all of the bonuses and features at Twister, and while they might be quite generic, they are still fun nonetheless. More importantly though, they represent a great way to win some big prizes, especially if you manage to get a good run of free spins. So, why not have a few spins at Twister today?